In our commitment to help bring out the best version of you while still caring for your skin, we have gathered and reviewed 5 of the most in-demand soaps available today. These soaps were studied and analyzed thoroughly so that we could find the best soap for dry skin based on moisturizing abilities, compatibility with your skin type and friendliness to the budget. 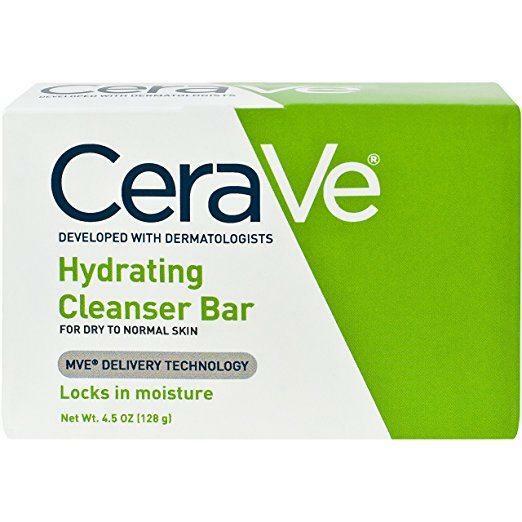 For a product that bears the NEA Seal, go for CeraVe’s Hydrating Cleansing Bar. It also contains ceramides that help restore and maintain the skin’s natural protective barrier. Grandma’s Pure & Natural Lye Soap is something even those with sensitive skin can use. A 100% pure soap, it is free of any harmful irritants and is ideal for dry, itchy winter skin. You should try the Extra Moisturizing Hand Wash by Jergens if you love the smell of cherry almonds. Highly-moisturizing, it comes in liquid form making it gentle and ideal for dry skin. The Beauty Cream Bar by Dove is a dermatologist-recommended product. It contains ¼ moisturizing cream, is safe for daily use and can also be used on the face. One with Nature’s Dead Sea Mineral Salt works by cleansing and toning while restoring the natural pH of the skin. It also contains Shea butter, an ingredient known to be highly-nourishing. Being accepted by the National Eczema Association makes this the best soap for dry skin. The NEA is very strict in accepting products into its list, so that means this soap is worth something. And if that isn’t enough, this product contains ceramides. Ceramides help by restoring and maintaining the skin’s natural protective barrier, a step crucial in achieving healthy skin. This soap also makes use of the MVE Delivery Technology. Unique to CeraVe products, this technology observes controlled release for hydration that lasts for 24 hours. A powerful body cleanser, it is gentle enough to be used on the face to remove makeup. A clinical study even proved that it is thrice more effective than other brands in locking-in moisture. Its hyaluronic acid content makes it even greater. Because of its moisture-binding characteristic, you’re left with nourished and hydrated skin that makes every head turn for a second look. This is the best soap for dry skin because it bears the NEA Seal. It is also non-irritating, non-drying, and non-comedogenic, so those with sensitive skin will have no worry in trying this. Being a 100% natural product makes this the best soap for dry skin. Its ingredients are lye, water, and lard, which means you’re literally going back to the basics with this product. Products containing lye terrify some, but we assure you it’s nothing to worry about. Its caustic qualities are removed during the saponification process, making it safe to be used in soaps. The magic happens the moment lye and lard start to mix. Lard is effective for relieving dry skin because it soothes skin and makes it softer. Having lard on your soap makes your skin look good. Those who are fans of applying makeup can benefit from this because it can help makeup glide-on smoothly. This is the best soap for dry skin because it relieves you from any itchiness and discomfort. It also leaves your skin moisturized, and with the presence of lard, may fight the signs of aging. Its moisture-rich formula is something you’ll really love. This product also gently cleanses the skin from any dirt and germs without leaving it dry and tight. The secret lies in its unique formulation. This liquid soap is enriched with real Jergens lotions, this hypoallergenic product nourishes by penetrating deep down the skin’s layers. What we really like is that it comes in liquid form. Liquid soaps are known to be gentler on sensitive skin than their bar counterpart, so this is really a huge plus for us. This product comes in a rich and creamy formula. It creates a lot of soft lather, is pH balanced, and contains the classic cherry fragrance of the Jergens brand that we’ve always loved. Its ability to soothe dryness makes this the best soap for dry skin. This product works from the inside to calm skin, and prevents dry skin from worsening especially during the winter months. The ¼ moisturizing cream content of this product makes this a great choice for dry skin. Also packed with mild cleansers, this soap retains the skin’s moisture without being overly-drying. This soap bears the brand’s classic moisturizing formula. Safe to be used not only on the body but also on the face and hands, it classifies itself as a beauty bar and not just an ordinary soap. Aside from retaining the skin’s natural moisture, it also replenishes lost nutrients during the cleansing process. This is key to healthier and softer-looking skin that radiates from the inside. This soap is gentle enough to be used by the whole family. An all-in-one beauty bar, it gently and effectively cleanses the skin without leaving it rough and tight. This soap contains mineral salts from the Dead Sea. Therapeutic, it acts by deeply cleansing and toning while restoring the natural pH of the skin. Another plus is that it contains Shea butter. This ingredient is great in restoring lost moisture, so having this in a soap for dry skin is really a must. What makes this product standout is that it is vegetable-based. Combined with genuine Dead Sea salts, this soap offers a natural and deep cleansing experience minus all the chemicals. The Dead Sea might be old, but this product won’t leave you looking anywhere near that. Because of its exfoliating properties, all you’re left with is skin that feels and looks younger. Another great thing with this soap is that it is triple milled. This allows for a longer-lasting and higher-quality bar, so you’re ensured nothing artificial comes in contact with your skin. What makes this the best soap for dry skin is that it uses the power of nature. We believe that going natural is still the best, and this product really stays true to its claims. Do not forget to moisturize. These help by providing a seal over the skin to prevent water from escaping, and in this case, the thicker the moisturizer, the better. Ointments containing petroleum jelly are is also a great idea. They are, however, very greasy, so it is recommended to apply them only at night. Opt for shorter bath times (5 to 10 minutes,) and only use warm water. Using hot water and bathing for a longer period of time tends to remove oils from the skin. Wear moisturizers immediately after bath. Use gentle, patting motions with your towel to dry skin and immediately apply cream or oil while the skin is still damp to help lock-in moisture. Consider using a humidifier, since indoor, dry, and hot air can parch sensitive skin and worsen flaking and itching. Just make sure to keep it clean to avoid the spread of harmful bacteria. Pick fabrics that are skin-friendly like silk and cotton, since they allow your skin to breathe. Though natural, wool can irritate dry skin. Also wear as much clothes as possible in colder weather like gloves, a hat, and a scarf, because winter can be extremely drying to the skin. When washing your clothes, wearing rubber gloves is advisable. In terms of detergents, choose the ones that contain no fragrances or dyes. The type of soap you use also plays an important role in caring for dry skin. The guidelines below will help you in choosing a dry skin-appropriate soap. Always go fragrance-free. Soaps that contain perfume can lead to itchiness and dry skin, so unscented bath soaps or those labeled as “for sensitive skin” as your best bet. Antibacterial bath soaps are also a no-no, as they strip skin from its natural moisture. If you really want to use this type, limit it to odor-prone areas like the groin, feet, and the armpits. A no-brainer, choose soaps that are packed with moisturizers. Examples include glycerin and oils such as avocado, jojoba, coconut, Aloe Vera, and cocoa butter. Dry skin can cause a lot of discomfort. It can lead to uncontrollable itching, so choosing your bath soaps wisely can greatly help with your condition. There are numerous soaps available for dry skin, but they are not created equal. Some claim to be “moisturizing,” but it’s the ingredients in them that really seal the deal. We have chosen the Hydrating Cleanser Bar by CeraVe as the best soap for dry skin. It gently cleanses the skin without disrupting the natural protective barrier of the skin. It is also great in sealing-in moisture. It contains the power of the CeraVe Moisturizing Cream, and is shown to be 3 times more effective in locking-in moisture than the leading brand.